Posted on Wednesday, January 22nd, 2014. Danny Gathercole swapped his ¼ mile treads for salt lake razor blades and gave his blown 28 A model a run at Lake Gairdner, South Australia. Posted in In The Garage and Race Results. Posted on Saturday, February 9th, 2013. 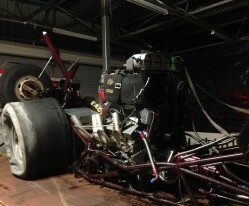 Wayne Jones BB dragster is making good progress toward a return to the track. 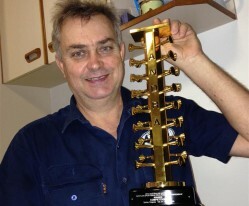 A custom crank trigger made by Wayne will enable better timing control and with two complete transmissions and a number of torque converters to work with the team are looking to be in better control of tyre shake. 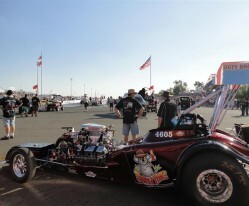 Built in 1996 the BB dragster with its iron 361cu.in, PSI supercharged smallblock Chev mated to a BGA prepared Powerglide rewrote the record book. The worlds first 5 second automatic pass was made. 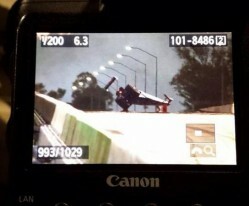 This happened at Willowbank on 14th Jan 1997 with an astonishing 5.967 second pass. 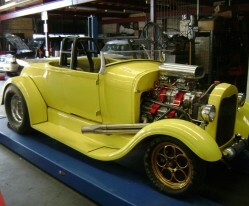 This with a Bowtie iron small block and original aluminum case Powerglide. 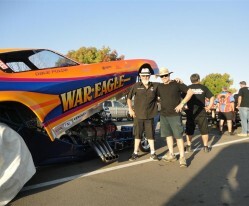 Australian Funny Car legend Jim Walton on left and Bob Grant had a great time crewing for the Leahy brothers at the 2012 California Hot Rod Reunion at Fomosos Raceway, Bakersfield. Jim, also a transmission shop owner, had plenty to talk about with Bob Grant. 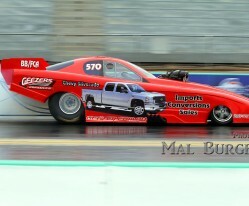 Jim ran the Thunder Downunder funny car among others. Posted on Tuesday, October 30th, 2012. 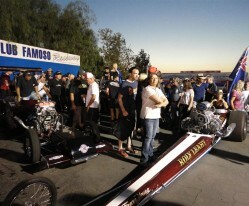 Teams from down under were recognized for their support at the Fomoso Nitro Nostalgia Meet. 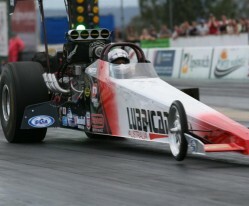 Greg Leahy drove the “For Ever Young” front engine dragster in exhibition pass’s in memory of his late father Roly Leahy. 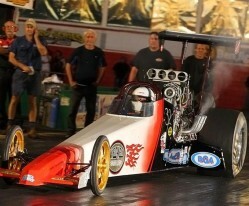 Peter Leahy drove the PartyTime altered to the final in 7.0 Pro B class at Fomoso Raceway Oct 21. A great achievement for his first time in the car. 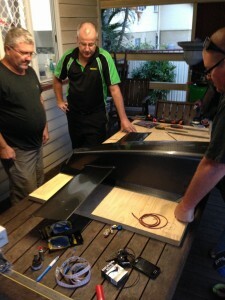 Co owner Greg Leahy said the team were estatic to make it so far with over 60 entries in the class.